December 2016 horoscope for Scorpio zodiac sign predicts that career issues can be played down and family matters require your attention. Until the third week, family environment is demanding and there will be misunderstandings due to financial issues. You should make efforts to restore harmony in the family in 2016 December. Majority of the planets are in the Eastern half of the chart in December 2016 for the Scorpios. Hence independence and personal enterprise will rule over social skills. You have to decide what you want to achieve and follow it up with diligence. Scorpio, you are not at the mercy of others and there is no need to make compromises. December 2016 is ideal for expanding your intellectual capabilities through higher education. You will have enough money to spend on academic interests. The Scorpio December 2016 horoscope foretells that after the 21st, you will get opportunities to enhance your professional skills through advanced education or training related your career. This will be helpful to further your business and career development in future. The House of money is extremely powerful in December 2016 for the October born with more than sixty percent of the planets stationed in it or passing through it. Naturally generation of money will be amazing and your monetary situation will be flourishing. You should not become arrogant because of money power and use excess earnings for the right causes. The December 2016 Scorpio astrology predictions also foretell that you will have the support of your spouse and social connections in boosting your earnings. Family members will help you financially or present you with fiscal openings. 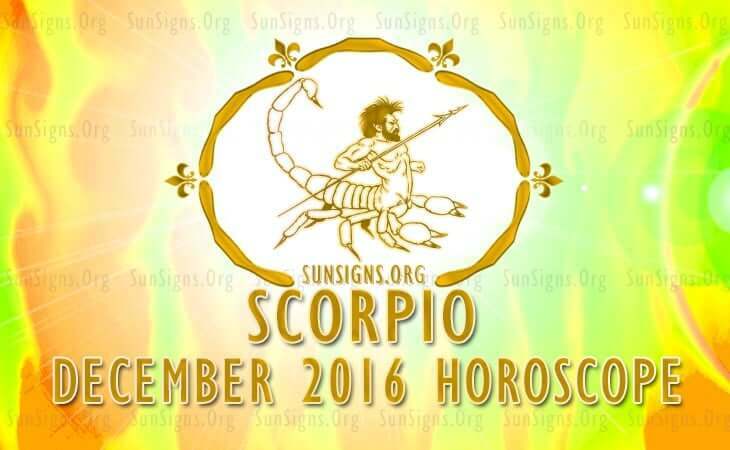 Romance will be superb in December 2016 for Scorpio in love. Single Scorpions can find love while chasing their monetary dreams. You will be attracted by costly gifts from your partner in your dates. Romantic flings will occur in academic environment and you look for intellectual capabilities in your mate. The 2016 love forecasts predict that marital relations with your spouse or lover will be extremely harmonious and passionate. There will be more sexual enjoyment. This is also an excellent time to plan for a baby. Scorpio health will be exceptional this month in December 2016 and can be boosted by attending to minor ailments promptly with simple natural home remedies. You look very charming and will have great energy. This excess vitality can be used for sports and athletic activities. Include barley, oats and red wine and eggs in your daily food intake. The Scorpio December 2016 horoscope forecasts this will be an energetic and fun filled month with good fortune and happy relationships.